Wilbur and Wilma have loved each other their whole lives, 10 years now. Wilbur, a three week old kitten was the lone survivor of a bulldozer that was blading the desert for a new shopping mall. 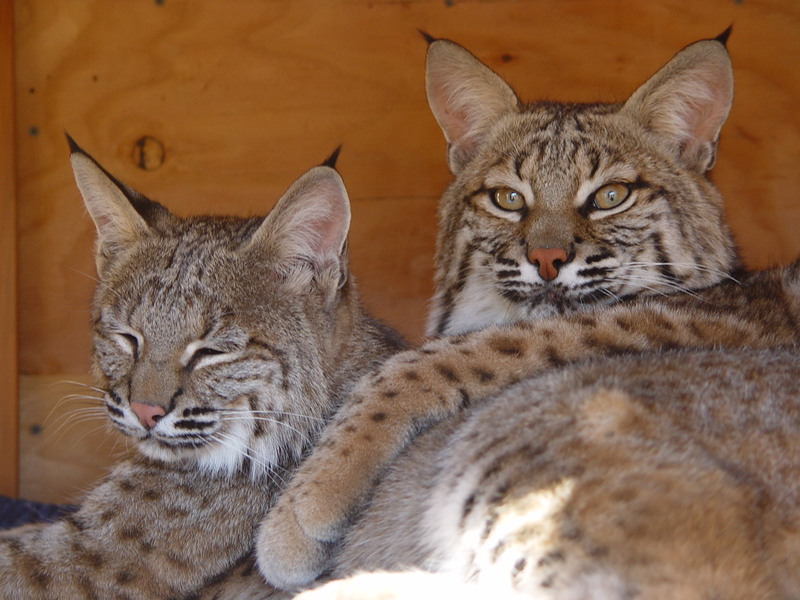 The dozer driver and his young son drove 20 miles to Tucson Wildlife Center where the boy, with tears in his eyes, lifted the kitten up to us, asking “will you help my little Wilbur”? Wilbur sustained a head injury and his life-long epilepsy is well controlled with daily medication. Wilbur enjoys his life with Wilma. Wilma was born under a storage shed on the edge of a beautiful golf course. A dog off-leash was dragging the little kitten out from under the shed when a lady rescued her. Unfortunately the lady was bitten by the kitten. Fortunately though, the lady insisted on getting the rabies series, thus saving Wilma’s life. Wilbur and Wilma have been the treasure of Tucson Wildlife Center, romping and playing together since kittenhood! Wildlife Center gets around 2,000 calls in 4 days about Hawks!